On this page we go over the Space Mountain track layout for the indoor roller coaster in the Magic Kingdom at the Walt Disney Word Resort in Bay Lake, Florida. Also mentioned and shown on the page is a Space Mountain blueprint or layout that we have created. Space Mountain has an interesting track layout that involves many twists and turns. Space Mountain has two different sides, Omega and Alpha, and there are two different track layouts. Each side is basically a mirror image of the other side. Since both sides are technically the same, we will discuss the alpha side, which is popular. The Alpha side can be considered on of the “popular” side because it is the side that FastPass+ guests are directed to. Space Mountain is one of the top FastPass rides in the Magic Kingdom and guests, including us, frequently use the FastPass+ program to get on the roller coaster quickly. 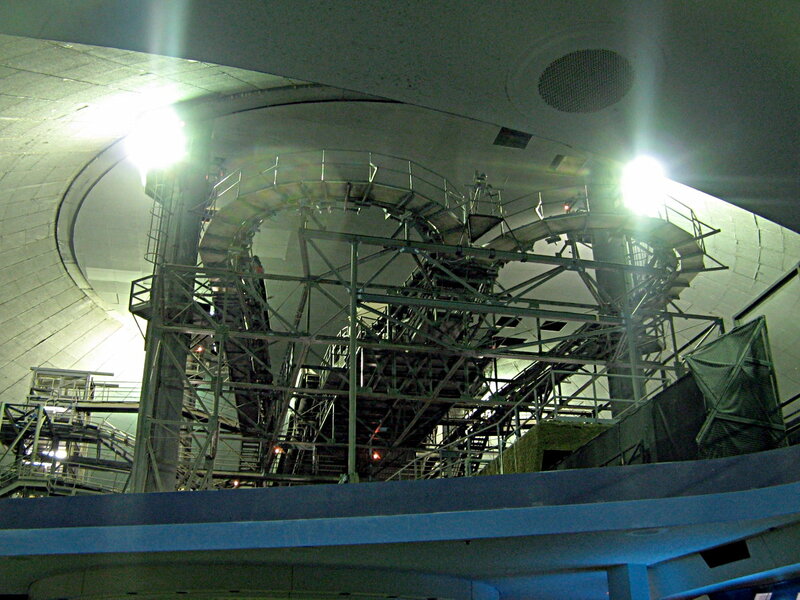 You can learn more about the Space Mountain and FastPass + here. Above Space Mountain track layout photo by WillMcC on Wikimedia Commons. Photo released under a Creative Commons License. The Alpha side has the following turns and drops that encompasses the entire Space Mountain layout. The Omega side has the opposite turns of the above track layout description for the Alpha side. You would just change left to right and right to left to get the layout for the Omega side of the ride. We previously mentioned that Omega was the reverse of Alpha; however, that wording could lead to some confusion as Omega does not operate in "reverse" when compared to Alpha. If you would like to get an overview of what the ride is like and a better idea on the track layout visit our Space Mountain lights on or video page. Both of those pages have videos of Space Mountain with the lights, which allows you to see how the track is setup. Currently we are unable to create a detailed track layout blueprint for the ride. The description above is the best we have at this moment. You can get an idea of how the ride’s tracks are laid out and where all the turns and drops are. The ride is “squeezed” inside of the building very well by using lots of turns to keep the ride within the confined area of the building. Combining that design with the darkness complicates verifying all of the turns and drops accurately. When we are able to create a blueprint for the ride we will post it here. You can learn more about Space Mountain at Walt Disney World by visiting the other pages here on the site.